Just wanted to know what you guys thought about the list. Some I feel are very random to be in there. Chicago Midway International Airport, Chicago, Ill.
Nantucket Memorial Airport, Nantucket, Mass. Hartsfield-Jackson Atlanta International Airport, Atlanta, Ga.
John Wayne Airport, Santa Ana, Calif.
Los Angeles International Airport, Los Angeles, Calif.
Eagle County Regional Airport, Vail, Colo.
Reno-Tahoe International Airport, Reno, Nev.
Atlanta is only on there because of Virginia Ave. Some • pilots rating those! RY 15/33 DIPS, SWELLS, POT HOLES, & RUTS ENTIRE LENGTH OF RY. RYS 15 & 33 MKD WITH CONES & MARKERS, MOST MISSING, & ONE THLD PANEL RY 33. Scary as in the airports in general are scary or approaches? KSAN should be up there. The only reason John Wayne is "scary" is because of the NIMBY'S that love the convenience of the airport, but hate that airports mean.... AIRPLANES. and Noise. But Harley's, which probably have a higher noise profile than a modern jet, are Aaaaaaaa-OK! I absolutely hate Harleys. 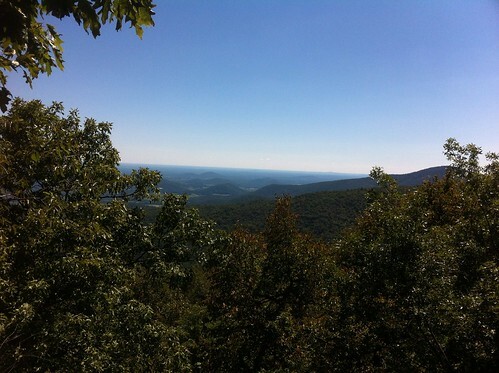 Two days ago the wife and I were hiking in Shenandoah Nat'l Park. Enjoying nature, relaxing. Found a nice peak with a beautiful view where we sat down and read for a while. I even snuck in a little bit of a nap. But every couple minutes some jackass on a harley drove by on Skyline drive and ruined the whole damn thing. To me the sound of a harley is no different than some highschooler putting a coffee can muffler on his civic. Shoot I would've included the entire south east portion of Florida. Its a miracle there arnt more incidents down there. Flying wise, not so much on the ground. Yea they have to turn those planes into ballistic missiles to get some of them above the noise. And also it has a pretty short runway for being a commercial airport. All of those are paved... so the list is very wrong. I'd rather shoot the approach into Vail than aspen or telluride if everything is going to crap. Also, the article says these are hair raising takeoffs or landings... uh no. Not remotely. The article actually asked what the most "demanding" airports to operate into were, not the "scariest", although they titled it that way. With that in mind, I am ok with the list for the most part. DCA, LGA, ATL and LAX can be very demanding. Lots of last minute runway changes, strange arrival procedures and goofy taxiway layouts. MDW does have VERY short runways for the operations that are run there (although somehow everybody but Southwest has managed to stay inside the airport perimeter). ACK does fog in VERY quickly, although with a good ILS and no terrain to speak of it's one of those airports where you try the ILS and either get in or don't and divert 80 miles away to a good, clear weather airport (unless of course you are trying to get in during a nor'easter or something). I've never flown into John Wayne, Bob Hope, RNO or Vail so I can't comment about those, but I'd guess they have similar issues. Runway 8 in Burbank is the real deal in an airliner, though I'll admit that these guys made some pretty serious mistakes. I don't know what's more shocking. 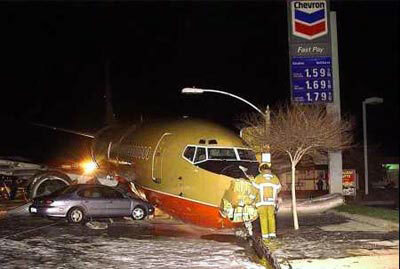 Seeing a 737 in a situation like that or the gas prices! I have no idea what the issue with orange county is. It's not even busy by socal standards. Burbank is shortish, has stupid noise restrictions, and like mdw swa has had an issue staying inside the airport. RNO has mountains in all directions, lots of major downdrafts from the sierras to the west. ILS is kind of steep... but not really. If you bust out early and follow the VASI you'll hit the rocks though... but that assumes you stare at the lights and not at the rest of the outside. Vail is sort of high and in the mountains... but there are a number of airports that are worse in both departments. Well, because the plane is in Southwest paint, I'm going to have to say the gas prices are WAY more shocking. I remember when I got my first car, and paying 99 cents a gallon....$12 dollar fill up!!! What makes runway 8 difficult? Just curious.